Well, I’m finally delving into the art of Artist Trading Cards thanks to our Cracker Jack Stamp Club! We’re hosting an ATC swap at our April meeting so I’ve been experimenting with products to use on them. This one is stamped, glittered and inked. 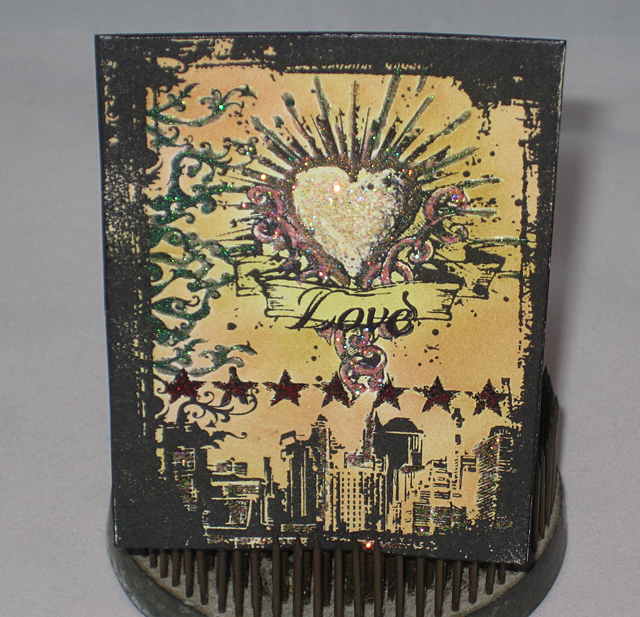 Skip on over to Art Glitter’s blog for a tutorial on how it was created. ATC cards are the best…. Our club is on hold, hoping to start back up soon. Thanks, Therese! Here’s hoping your club starts up soon! Very cool Linda! We have been making ATC cards for years! Nice job! Can’t wait to trade with you at the next Cracker Jack meeting! What a fab ATC! Watch out…. they can be addicting! Thanks, Marjie! I made my first one for Halloween and really enjoyed it. I can see where it can be addicting!